Lettuce garden after the harvest. They are seen rotting due to successive heavy rainfall for a week. Ms. Sok Sier, 60 year-old, is a farmer in Kok Rumlich village, Ka Heing commune, Samroang Toang district of Kampong Speu province. She has been a member of PUAC since its establishment in 2001. PUAC stands for Peri-Urban Agriculture Center established with the supports from a Belgium NGO Aide au Développement Gembloux (ADG) in partnership with a local NGO “Cambodian Women for Peace and Development (CWPD), with the mission to supports farmers to have access to technical knowledge and know-how on production of chemical-free and high value vegetables, and to link producers to markets. Ms. Sok Sier grow lettuces on a plot of 500 m-2. 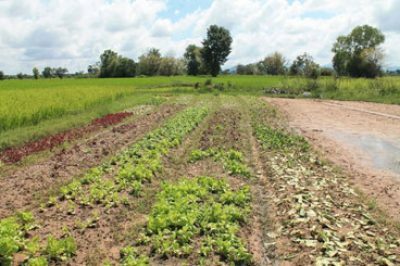 This plot is located in the middle of lowland rice fields and next to a lake, which is the water source for irrigating vegetables. Growing lettuces on this small plot allows her to earn between 150 and 250$ a month, without hiring any labour. She manages this with her husband. She has decided to grow lettuces because firstly it has high market price and secondly she does not need to worry about the market demand because she can have guaranteed market access via PUAC. She grows ten different types of lettuces (romaine, red romaine, iceberg, green butter head, red butter head, lollo rossa, frisee, batavia, and red batavia, oak leaf) as required by the markets. 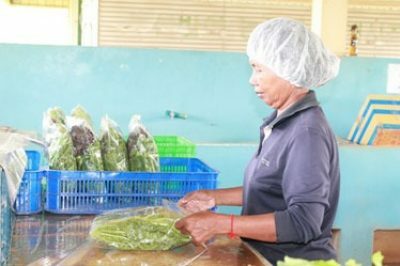 Her production cycle is very two weeks, meaning she grows lettuce at every two week intervals; this allows her to harvest two or three times a month. Every month, the harvest is about 200-300 kg of lettuces, and the selling prices are 0.675$ for eight lettuces, and 0.775$ for red oak leaf and lollo rossa. The expenditures are of less significant amount (seed, bat manure and gaseline for transporting produces to PUAC). There is no use of chemical fertilizers nor pesticide. Only organic inputs (solid and liquid compost) are used. For the liquid compost, she soaks a kg of neem tree’s bark, unspecified amount of Eupatorium odoratum L and 400g of bat manure in cattle urine in a jar of about 500L. The mixed materials are left for two weeks for the decomposition before the solution can be used. The solution is then mixed with water at a ratio of 0.5 L:15 L for the watering of vegetables. Watering lettuces with water is done following the use of solution. The watering of this solution can be done twice for a cycle of lettuce, namely a week and 25 days after transplantation. The solid compost is used as basal application. Solid compost is a mix of cattle and chicken manure and other crop residues, which are collected and deposited in the compost cage. Four ox carts of solid compost are applied at each time of lettuce growing. In growing lettuce, Ms. Sok Sier highlighted two important problems, namely hot weather during the dry season especially in April and May during which lettuces could not grow well, and successive heavy rainfall causing the rotting. “The rotting due to successive heavy rainfalls has occurred this year, which is very exceptional,” she said.